I know typically on Mondays I share my weekend recap, but I had to head to San Antonio for work over the weekend and won’t be back until Wednesday night. So, today I have something new and hopefully entertaining for you to see. I don’t think bloggers ever just show pretty pictures to deceive their readers. I think it’s just more along the lines that we know you don’t want to look at our embarrassing messes. But, sometimes, that can also paint a picture that isn’t always reality and it can make some feel like our lives are always perfect. Today is a little glimpse into reality! I can pretty much guarantee that on any given “photo shoot” day, I’ve some dirty secrets lying (shoved) in the corner. 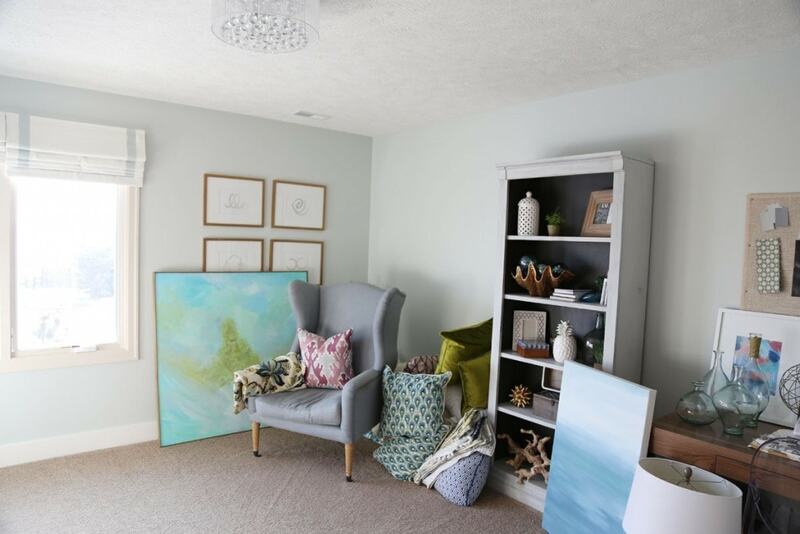 BUT, if you want to see the pretty, styled version of our home, be sure to check out our summer home tour from last year! The dining room lately has become my home decor dumping grounds for some reason. Both of the corners on each side of the buffet are home to all the items I’m currently not using and it looks bad. Our mudroom still has Christmas decoration up. And pretty much every coat we own is on the four hooks (instead of in the coat closet on the opposite wall). 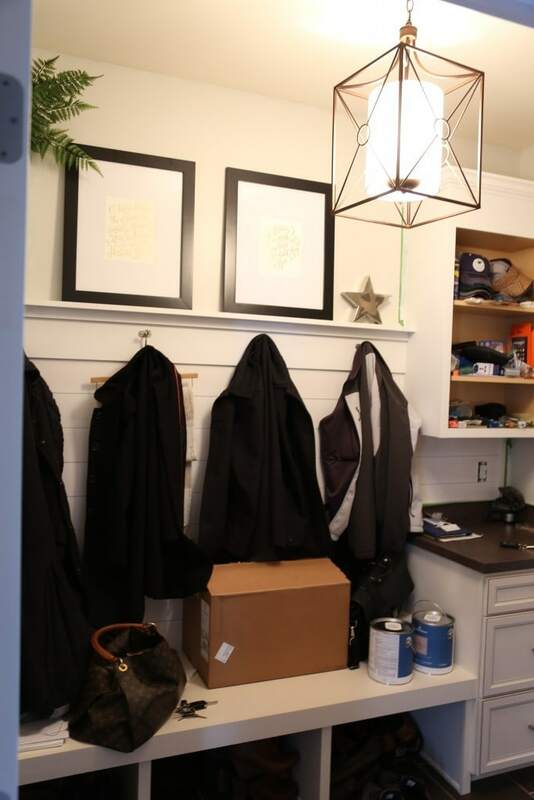 Not to mention, we’ve been working on our mudroom makeover for well over a year and a half, and the Frog tape is still on the walls and the cabinet doors are still missing. Our bedroom tends to be the worst room. I still have the wreath from Christmas up over the bed, and we pretty much always have clothes strewn on the floor/bench/hampers. I clearly have a jewelry, laundry and not-returning-clothes-on-time problem. As a side note, we typically don’t allow our cats in our room, so when the door is open, it’s like the it’s the only place in the house they want to be. My craft room definitely isn’t any better. I like to think of it as the throw pillow graveyard. Although many pillows end up being resurrected here. This was shortly before I had put away all my Christmas decorations on the main level so a lot of our everyday decor was here as well. But you can pretty much guarantee there are always pillows stacked high in that corner. 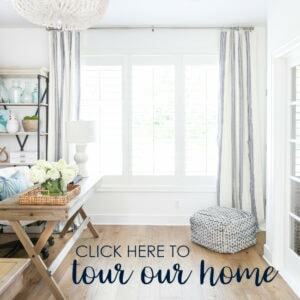 Now be sure to check out all the other real life home tours from some amazing bloggers! Hahahahaha this makes me feel good! thanks for sharing! Thank you for your courageous honesty—it is a home with life happening. Love this post so much!! Thanks for sharing 🙂 Makes me feel like I’m not alone. LOL! LOL! I will be using that one a LONG time! Mine is combo office, wedding planning, sewing to do and ebay to post, along with at least a million home projects. Thanks for being so open. 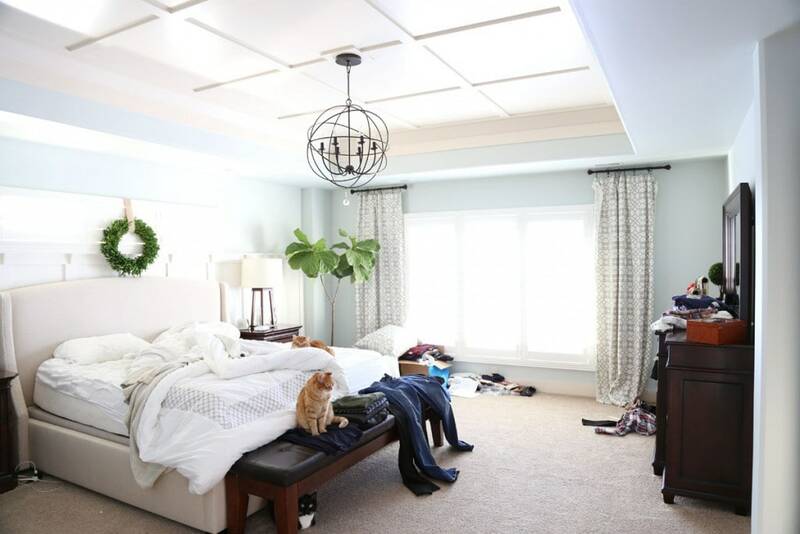 I love your bedroom carpet…..name of color and manufacturer please? Hi Natalie- unfortunately I don’t know! We are the second owners of the home so I don’t have the info. Sorry! I follow numerous home and fashion blogs and I NEVER comment on anything!! This is my favorite post ever because it makes me feel soooooo normal!!! Thank you thank you thank you!!! Refreshing!! Reading blogs that are as beautiful as yours, can at times make me feel my home is a disaster, despite all my efforts. Thank you for reaching out to remind us we are all in the same boat! This is so GREAT! Your home is still gorgeous even when it’s not styled/perfect! I have been following you for a few years – your home has been my inspiration (we’ve repainted our entire house in your wall & trim colors!) It’s so great to see I’m not the only one with to-do projects and “stuff” that needs a home. THANK YOU! I never see perfect homes except in blogs and museums……..bless your mess and mine…….the real homes! 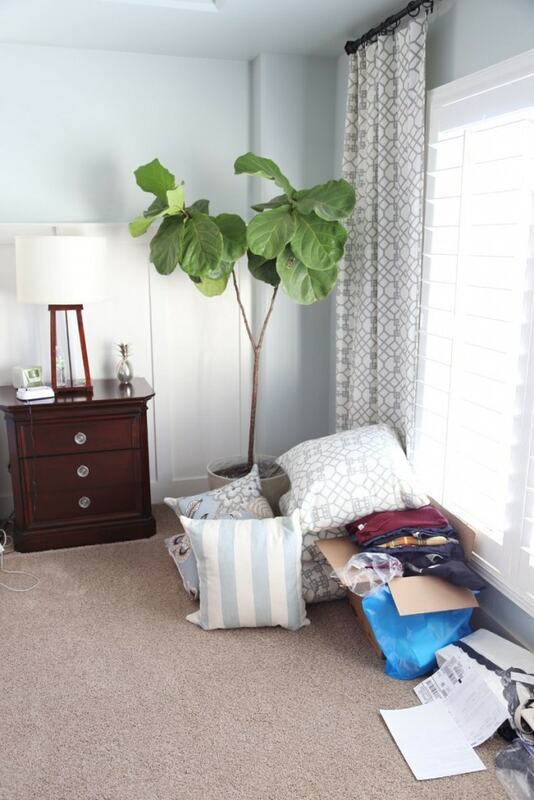 I’ll now embrace my messy ( but not dirty) home between cleanings and straightening ups….it does get done eventually or just before company. 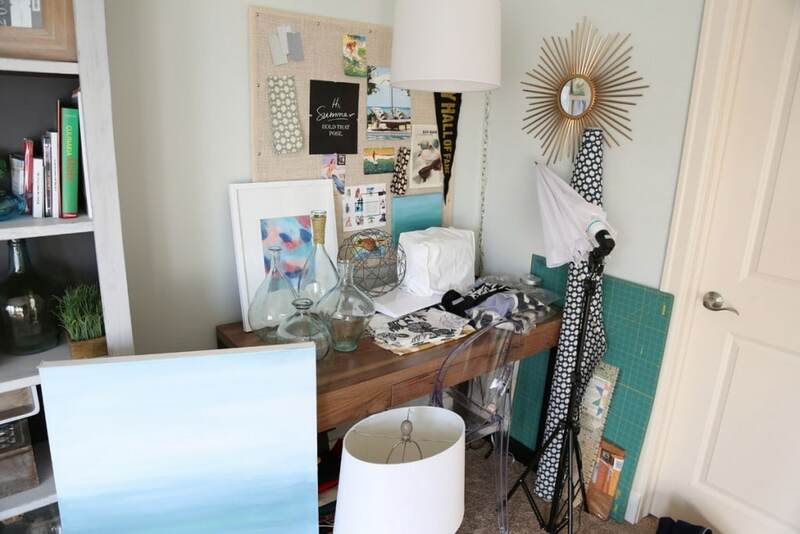 I love my lived it look, not the sterile ” don’t come in here look, because I’m saving it for show” Thanks for sharing! I agree, it is what LIFE is made up of…although, for me, it is exactly what my life seems to be like all the time. We moved into our house 16.5 years ago and the garage and basement are still full of boxes…to the point that when we try to finish the basement it is just tooooo monumental. We are paralyzed when it comes to cleaning out our past lives and finishing the basement. A word to those of you building – finish the basement off before you move in! We have seen a car in the garage one time. Love the commentary and awesome photos! 😉 Returning stuff on time is such a struggle! I never feel like I can get rid of the boxes just in case I decide to return it. Thanks for participating! Such a fun tour. 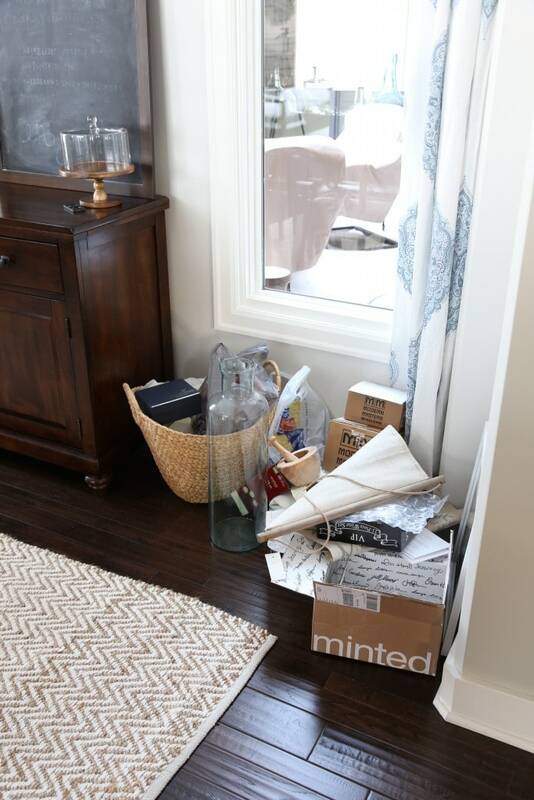 I love seeing the messy house tours and the reality behind the lens! Makes my crazy house feel a little more normal. Even without everything perfectly in its place, your home is still gorgeous, Sarah. 🙂 You have so much talent girl! Girl this makes me feel so much better!!! Thank you thank you thank you! 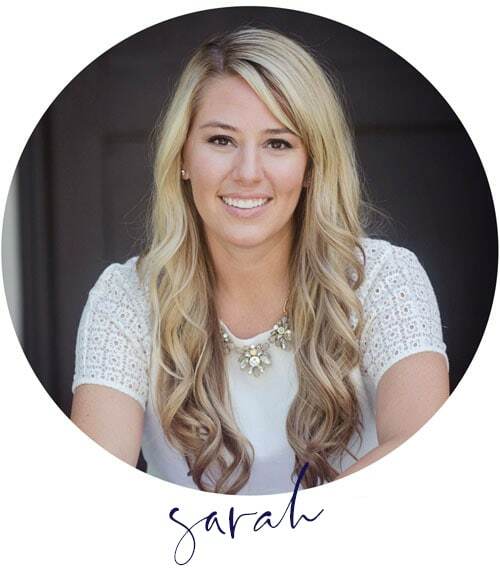 Sarah I love your blog and your honesty! We blog readers tend to think that your homes are always perfect. Not like ours!! I still have boxes of Christmas decorations that need putting away.I laughed when I read the previous comment from the lady who said that she tends not to make the bed when the cats are on it. I’m the same!!! 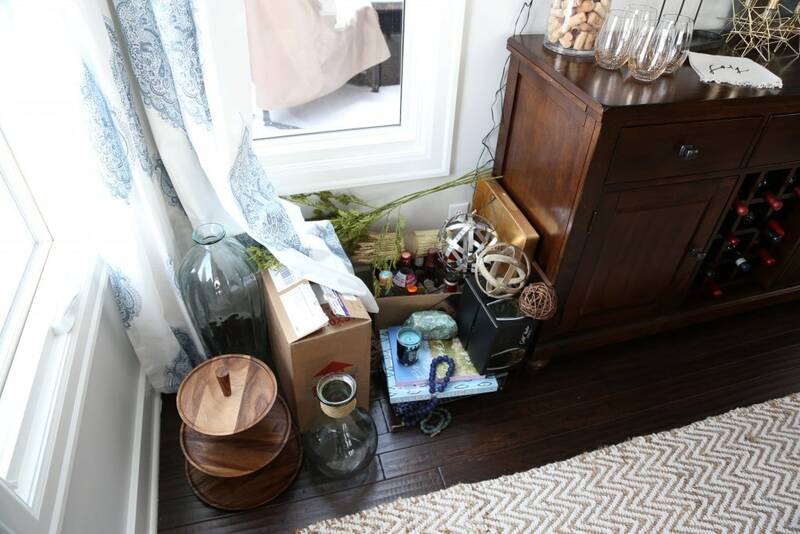 And Lauren I follow your blog your home is gorgeous don’t believe it’s ever crazy. Thanks for sharing this! Makes me feel better that I always have a million dog toys strewn about the living room – and we rarely make our bed! Loved seeing your house! 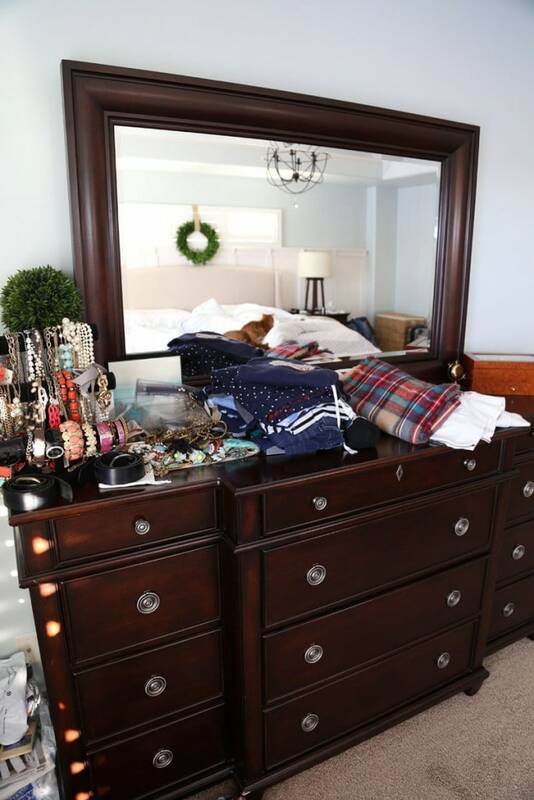 It’s funny how we all have the same issues – not returning things, dressers piled high with stuff, and cats who refuse to stay off clean clothes! XO! Love it, love it, love it! Women always put so much pressure on ourselves-this post just let me take a big sigh of relief. Thanks so much! I love this honest look behind the scenes. Real life of a blogger…it’s not all magazine cover perfect. Thank you thank you,all our homes are imperfect,it makes us human. Your home seems loved and lived -in. Enjoyed this post. Oh my goodness love this! Your home is so bright and beautiful! And I can totally relate to all of the project piles. I feel like I always have one around every corner. So glad you were a part of this loop! What an amazing blog! I regularly read your blog and love your style and these posts are some of my favorites. Lets us know you are human and I love that! Ok, so I’m not the only one with a pillow problem or who puts things in the dining room corner when I’m rotating decor! Thanks Sarah! I think I’m only going to follow the design blogs that do a “behind the scenes” like this. 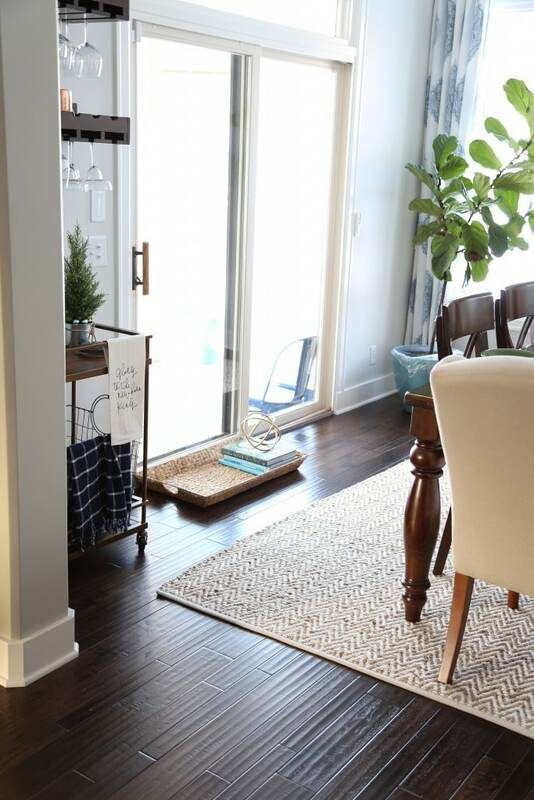 So many times looking at beautiful staged photos, I feel so “less than.” But we’re all just doing the best we can and sometimes that means you can’t see the laundry room floor for the mountain of washing you still need to do! THANK YOU! I’m a bit late in reading this but I absolutely LOVED the real life look of your home. I believe we try to be so perfect in how our homes look (as everyone tends to judge a woman by her home)…..Though we are drawn to beauty, a home, if truly lived in, has to have its messy parts. I keep the front 3 rooms of my home clean all the time, but once you go past that, well, life begins! Thanks for bringing some normalcy to all this. Thank you I keep my downstairs clean but my upstairs is always a mess & yours is not bad at all it just shows that you are real. Small messes in a couple of rooms. No big deal. I love your home & I have never been to Omaha but it looks like a beautiful place. I’ve read your blog, along with many other, for years. I’m always floored at how everyones places look so amazing. Like, where do ya’all store everyday life? I’m thrilled to see this post. I applaud your honesty. Thank you.